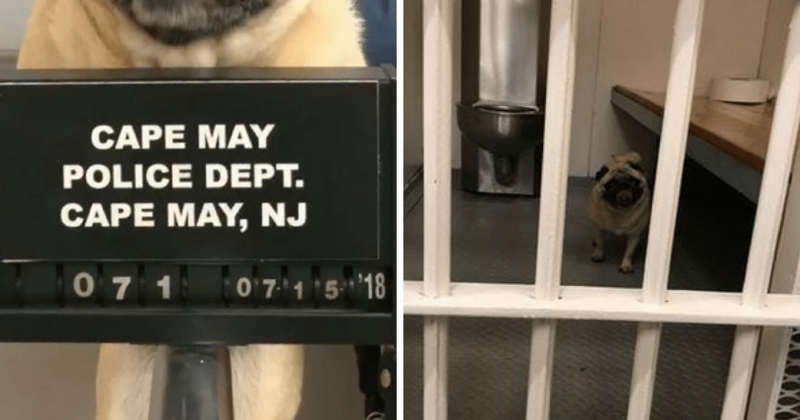 A pug was arrested in New Jersey for trespassing on Sunday, July 15th in the town of Cape May. The little gremlin was caught “sneaking” through several yards on New Jersey Avenue that day. The furry criminal had no prior record of criminal activity, but police officers wanted to send a message to other questionable pugs considering running away; stay at home if you don’t wanna get picked up by the Men in Blue. Even without prior charges, the pug was in some serious trouble. Weighing in at roughly 20 lbs, and about 24 inches tall, officers took a “pugshot” and uploaded it to their Facebook page for help with identification. The backyard terrorist got immediate attention on social media, and the rumors began to fly! One Facebook commenter wrote that the dog was arrested for her combative personality, calling her PUGnacious! Still, until proper parties were reached, the Cape May Police Dept. had to keep the unidentified pug in holding. Not just for the pug’s safety, but for the safety of the community back-yards as well. Although the street-savvy pug was caught in the act redhanded and with plenty of witnesses, Facebook viewers couldn’t resist the pug’s innate cuteness. Before long, another commenter on the pugshot post came to the pug’s defense, claiming the pug didn’t choose this “pug” lifestyle. While waiting for positive identification of the guilty looking canine, the police department posted a second photo of the pug-thug in its jail cell on Facebook. 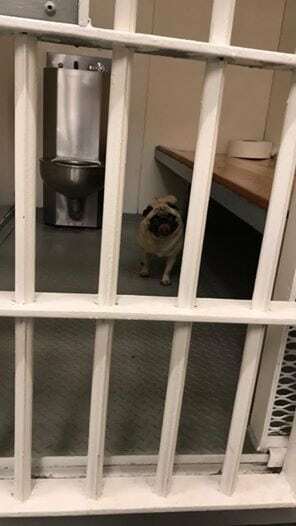 After spending the better part of his day in lock-up, viewers within the Facebook community began to grow worried about the pug’s release. The officers of Cape May posted an update later in the afternoon that its humans had been contacted, and that the sly devil identified as a girl named Bean! You can tell the stubby crook isn’t copping to a thing! One astute reader pointed out the calm, cool, collected vibe rolling off the pug most likely indicates that he’s got a legal backup of some sort. He knows his humans will get him out of this. They can’t resist him and all of his stinky charms! The police informed Facebook that Bean would be released soon that day after her parents posted her bail, of course. Just in the nick of time too, as commenters were getting restless regarding her dubious situation. One reader even frantically claimed that the pug-thug would end up having PTSD! Not to worry though, CMPD had everything under control. With the owners contacted, bail was set to post for her same-day release. Apparently, Bean works as a team, because her human knew exactly what to bring to get her out of this mess. As her bailout, Bean’s owners gladly brought the police department a big round of cookies from the renowned Cape May Peanut Butter Company! The department was pleasantly surprised, and bean doesn’t look too out of sorts about the ordeal either! The CMPD received an outpouring of love from their Facebook followers, thanking them for their humor and willingness to go the extra mile to get this fearsome pug off the streets! The comment that stuck out the most though, was Bean’s owner, Hadley Hubbard’s. She wrote them a sincere thank you for taking care of her tiny terror. Hopefully, Bean has learned her lesson…getting arrested can mean losing your cookies!